The closing date for entries for the annual competition to design the Regatta T-shirt is fast approaching and entries are due for submission no later than March 29th. With the Regatta’s reputation firmly rooted in local tradition the limited edition T-shirt is a highly coveted asset guaranteed to sell like hot cakes. 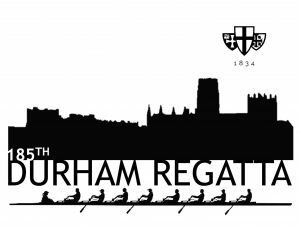 Normally the competition has been restricted to Durham University college boat clubs but this year its scope has been extended to also include local schools and rowing clubs. Entries need to include a business plan in addition to the shirt design. The competition is always keenly contested as proceeds from sales can prove very lucrative, as was the case for last year’s winner, Hild Bede College. The winning entry will be selected by the Regatta’s Executive Committee at its next monthly meeting and the winner notified by April 12th. T shirts of a single design in a range of colours and sizes will then be printed by the supplier prescribed by the Committee in the week leading up to the Regatta, ready for sale over the Regatta weekend. March 29th is also the closing date for trade stand applications. 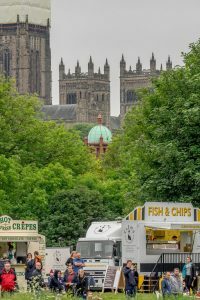 The Regatta regularly receives a large number of applications from a diverse range of traders, including many catering outlets, and as pitch space is limited all are subject to acceptance by the Committee. Applications opened in January and are generally considered within a month of receipt, meaning capacity is likely to be reached well before the closing date. The Regatta also offers a range of sponsorship and advertising opportunities, ranging from Principal Sponsorship to programme advertisements and individual race sponsorship. As a not-for-profit event any proceeds generated are returned directly to the local rowing community in Durham, such as through provision of grants for coaching or to support longer term projects like river dredging and facility improvement. Sponsorship of Durham Regatta offers a great opportunity for any business.